As I've mentioned previously on this blog, I do occasionally need to reference the webs and internets to get some of these references. I looked up foily sticker, and the first result in Google was another post on this blog . Congrats on the SEO Frankie's Apt, but it's no help to me as it's like asking someone what an aligator is and getting the response "not a crocodile." 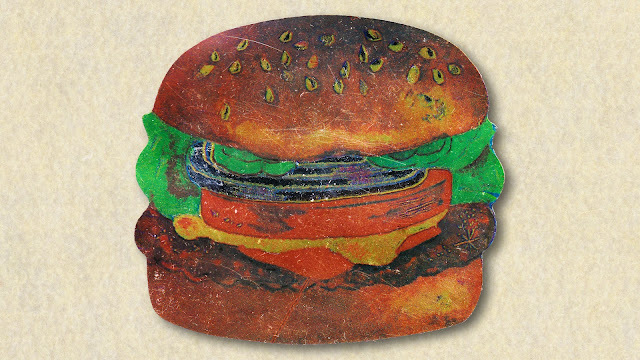 After comparing results, I see a foily sticker is made of foil (although I'm still not sure), and it is not as a originally assumed, something meant to foil my plans for grabbing the burger because it looks realistic. Sorry the Foil didn't photograph too well. There was one where you could see my eyes in the onions (they're pure foil, not printed on at all), but if I went with that one, the rest of the sticker would have just been in the dark. I get all my foilies from the sticker vending machine at Keyfood.